In 2013 the people in the Netherlands commemorated that slavery was abolished 150 years ago, in 1863. In 2008 the exhibition Black is beautiful Rubens to Dumas in the same Nieuwe Kerk in Amsterdam showed the depiction of black people by artists of the Low Countries during seven centuries. Numerous works at this exhibition were directly or indirectly related to the slave trade. In most cases, the artists depicted pretty and healthy people. Below is one of the many examples from the exhibition in The Nieuwe Kerk. The anonymous messenger on the print wears large round earrings and a chain, smiles amicably and holds a staff in his hands. His body is pointedly well proportioned and muscled. The attitude he has adopted is the contraposto, a classical pose in ancient Greek sculpture whose aim was to create an illusion of life by the suggestion of a small step forwards. It became one of the most important poses in western art. The print was designed by Jacob Smies and executed by the engraver, draughtsman, etcher and lithographer Abraham Lion Zeelander. 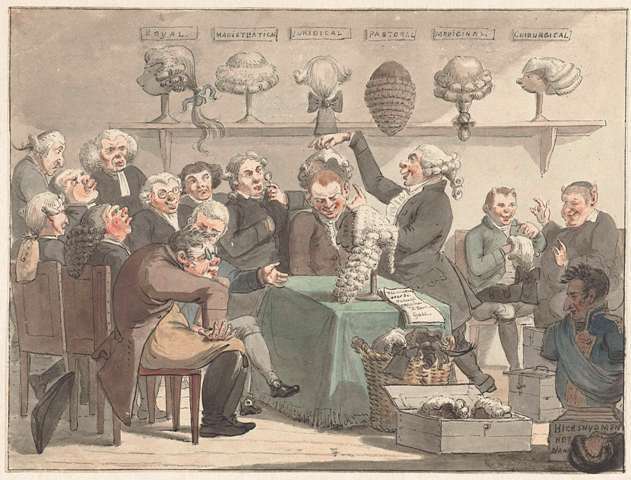 Smies chiefly produced caricatural works, a fact which may have influenced the finish of this print. Neither Smies nor Zeelander ever went to Africa. 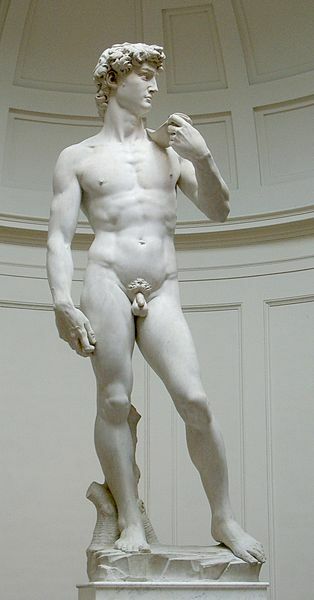 Since Africans had by now gained a reputation for being well proportioned and muscled, and as figures from classical antiquity and the Renaissance belonged to the absolute canon of art around 1780 –1820, it is possible that Smies took the man’s pose from Michelangelo’s David (c. 1504), one of the most famous sculptures of a muscled, well-proportioned man in western art. 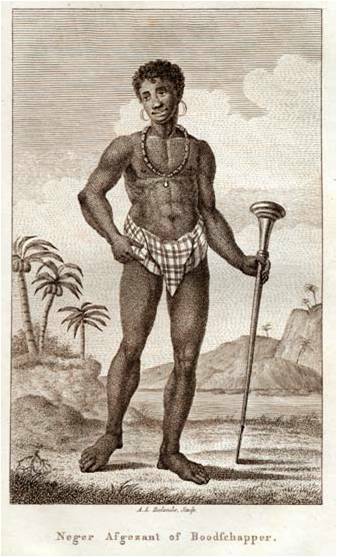 The print comes from the book Reizen op en beschrijving van de Goudkust van Guinea, whose author, J.A. 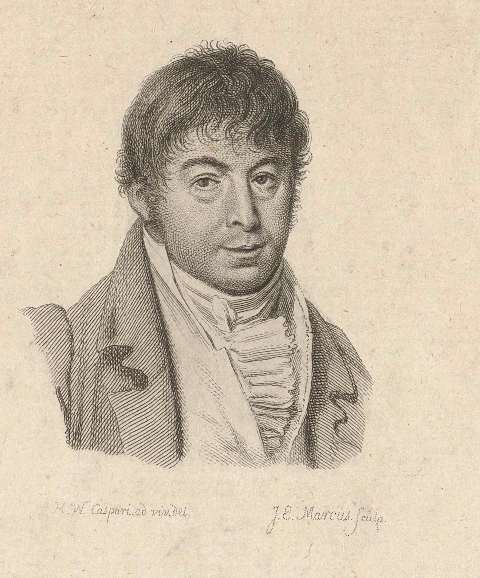 de Marree, had visited Africa, on a trip to the Gold Coast in 1802 –1804. This book is a compilation of what he had ‘during a lengthy stay collected and largely self seen, experienced and brought together; it was accordingly furnished with‘logs, a map, plates and proofs. Two plates are included in the book, one of Fort Elmina, which is lyrically described by De Marree, and this print of an envoy or messenger. De Marree describes the people of the Gold Coast in detail and pays special attention to the pros and cons of the slave trade, comparing and contrasting two differing views. Opposed to slavery is a European, in favour of slavery a king of Dahomey. ‘If thou hast no more need of slaves why not then, extempore, the whole truth be told, that the slaves, which thou hast already bought from us are sufficient for the region for which thou bought them, or that the artisans who were accustomed to make lovely things, are all dead, without having instructing anyone to make more of them? Apparently the king also saw the disadvantages for his country of the outflow of people.